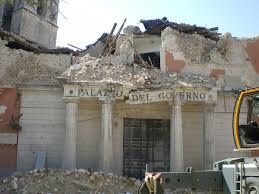 Its 9 years ago today that an earthquake shattered Aquila. Reconstruction continues though the state sponsored reconstruction seems to have ground to a halt. Not one school has been rebuilt – all are housed in prefab structures. While private citizens – those with insurance or deep pockets have managed to rebuild, everyone else still lives surrounded by an impressive amount of scaffolding and rubble. The money is there, we are assured, but bureacratic problems prevent it being spent. Its 38 years since the last big Napoli earthquake – and people are still living in containers. Its 107 years since the great Messina earthquake, and unbeilievably, there are still families living in the huts provided for the homeless at the time. Earthquakes are brutal, but you cant help feeling that in other countries the lessons are learned much more quickly than in Italy – and why the government doesnt introduce a state backed buildings’ insurance scheme is beyond comprehension. The feeling that the state will eventually pay is so ingrained it leads people to live for generations in temporary housing amidst the rubble of their former homes,, and yet noone seems to want to address the problem. Posted on 06/04/2018 by rammers. This entry was posted in Uncategorized. Bookmark the permalink.